We’re so proud and humbled to have received such a great review from Jean Le Boeuf the mystery diner at News Press. At Beach Brothers BBQ in Cape Coral, smoke is in the air, and ribs, brisket and jerk chicken are on the menu. A white pop-up tent sits in the far corner of the parking lot at Beach Brothers BBQ. It’s the kind you’d see crowded with camping chairs at a tailgate party. But here, near the corner of NE Sixth Street and Del Prado Boulevard in Cape Coral, it’s crowded with a cast-iron smoker and cords of wood. 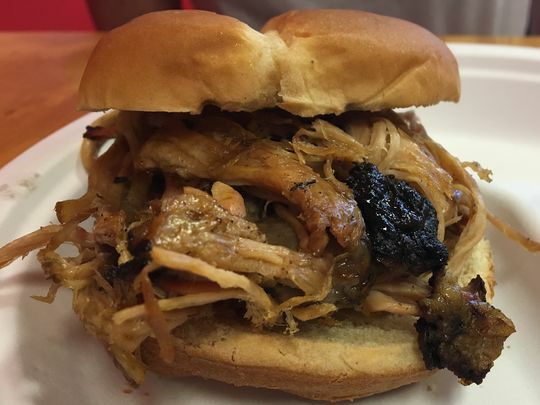 Stop by at the right time and you’ll catch owner-pitmaster Lloyd Peoples making one of his infinite runs from the restaurant’s front door to said tent. He’ll be carting trays of chargrilled jerk chicken (if it’s Tuesday or Thursday), or platters of wobbly brisket (if it’s Monday and the day is young). Mr. Peoples opened this small restaurant two months ago with his wife, Susan. Tucked into the old Cedar Café space behind Pho Vinh, the homey little joint has proven a Godsend for the Cape’s barbecue-starved residents — folks tired of settling for big-name chains, of driving 20 minutes for something so simple as a good plate of ribs. At lunch Beach Brothers’ dining room might be the safest place to eat in Lee County. Paramedics crowd the stools at the counter. Firefighters line the tables. Police officers linger near the door waiting for takeout. Meanwhile, the Peoples’ family hustles out baskets of nachos topped in smoky strands of pulled pork and house-made pico de gallo. They emerge from the small kitchen, which is separated from the dining room by a half-wall topped in towering BBQ trophies, with armfuls of various meats, all of them smoky, all of them tempting. Picking just one is the hard part. You want the andouille and the ribs and the smoked chicken. But Beach Brothers’ menu doesn’t allow for combos, so pick you must. It is, fortunately, hard to go wrong. The pulled pork is served in tender shreds tinged with smoke and made better with a chopped slaw that’s creamy, yet light. That andouille snaps deliciously between your teeth, the taut skin giving way to rich sausage fragrant with spice. This kitchen doesn’t shy away from heat. The black-eyed peas pack a wallop of it. It creeps up on you in the collard greens, too, and in a seriously delicious side of dirty rice that leaves you mopping sweat from your eyelids. There’s heat in Mr. Peoples’ rub, which means there’s heat in all that rub touches. When the ribs are juicy and cling-to-the-bone tender, that heat is awesome. But when they’re dry and a bit gray, that rub can taste acrid, like smoke gone wrong. Consistency is this young restaurant’s biggest problem. Rib tips had a rubbery chew one day, a perfect tenderness the next. Mr. Peoples has a surer hand with chicken, and with that coveted Mondays-only brisket, which was a marvel of soft fat and juicy meat on the one day I was able to procure some before it was gone. But even with missteps, Beach Brothers still has me cheering for it. There’s Kool-Aid on the menu (#TBT), and a fresh-squeezed lemonade that brightens even the dreariest El Nino-winter day. Mrs. Peoples’ potato salad, creamy and peppery and perfect, deserves trophies of its own. 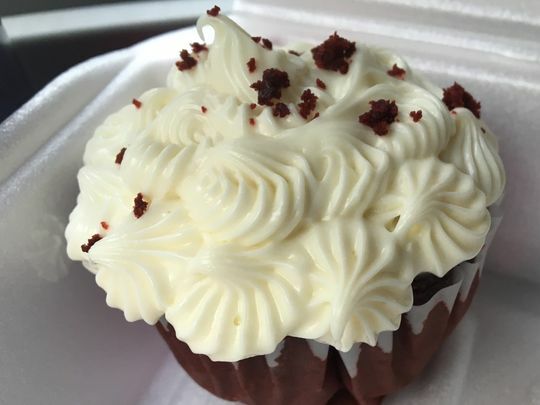 As do her red-velvet cupcakes, which taste of cocoa powder and cream cheese (not red dye 40). As her husband walks back and forth to the white tent, Mrs. Peoples walks the dining room, regaling customers with stories of their years living in Nashville, where barbecue and comfort food are a way of life. She’ll ask to take your picture to put on the wall (both literal and Facebook). It’s not because you’re the food critic, it’s because you’re her customer and she wants you to come back. I’m not much for pictures. But I’ve been back, and I’ll be back again.